RECEIVE YOUR OWN MULTIDIMENSIONAL DIAMOND ENERGY CHAMBER IN YOUR CELLS AND AROUND YOUR ENERGY FIELD! The Sacred Diamond Chamber is the CORE of the Diamond Technology. Jacqueline Joy's Multidimensional Diamond Team transmitted the Sacred Geometric Energy infrastructure into her physical cells, with meticulous specifications of Color, Form, Information and Light, over a 9-year period beginning in 1992. Its vibrational power is constantly expanding. 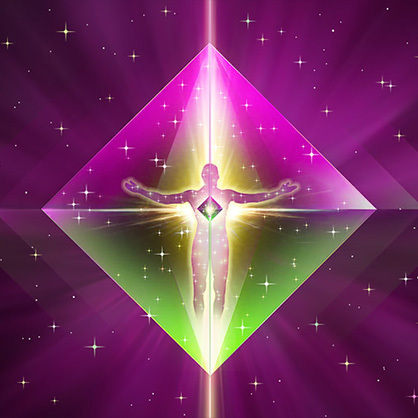 With the Diamond Chamber installed in your physical cells, all future advanced Diamond Transmissions are grounded, integrated and experienced in your body/mind, gracefully, powerfully and safely. Increases your ability to be comfortable in the "unknown"
Activates your openness to "Infinite Possibility"
Experience increased FLOW of Divine Source Energy through your body/mind! Expand Joy in your Body!!!!! Receiving Jacqueline Joy's Diamond Installation Transmission Multidimensionally (via MP3 recording) is just as effective and powerful as receiving it via the "LIVE" event, as it is transmitted at the Multidimensional level of Diamond Consciousness, beyond time and space. Once you have received your Diamond Installation, you are eligible to participate in ALL future "LIVE" Diamond Installation events - FREE OF CHARGE. Please write Sondra@DiamondAlignment.com if you have questions.